We love CookingLight.com ways and mashing two amazing foods into one is like heaven. This sweet summertime fruit mixed with savory flavors will turn you into a “I will take the last slice” kind of person. Here’s Cooking Light.com’s step-by-step recipe. Combine onion, vinegar, sugar, and salt in a medium bowl; let stand 15 minutes or until onion is softened, tossing occasionally. Combine 2 teaspoons brining liquid and 2 teaspoons olive oil, stirring with a whisk. Drain onion, and discard remaining liquid. Brush olive oil mixture onto both sides of watermelon slice. Grill watermelon 3 to 4 minutes on each side, until well marked and juicy; place on a serving platter or cutting board. 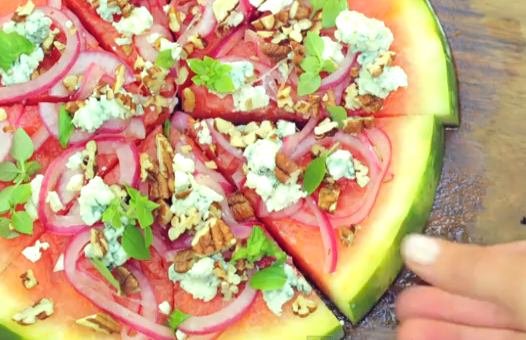 Top watermelon evenly with pickled onions, blue cheese, and pecans. Sprinkle with basil. Cut into 8 wedges.